Our last blog post reviewed the pluses and minuses of doors made of different materials. Beyond its components, a door has other attributes to consider before purchasing. A slab door is the door only, without hinges, knobs, or frame. Slab doors are often installed as interior doors. They are cheaper, which makes them more manageable to buy in bulk. Interior doors don’t need to close with a tight seal, so contact with the frame is not as crucial. BBR Window and Door Specialist Greg Caplan recommends a slab door if you have a historic home with a strong frame already in place. Pre-hung doors are already hung in their frames and include hinges and knobs. 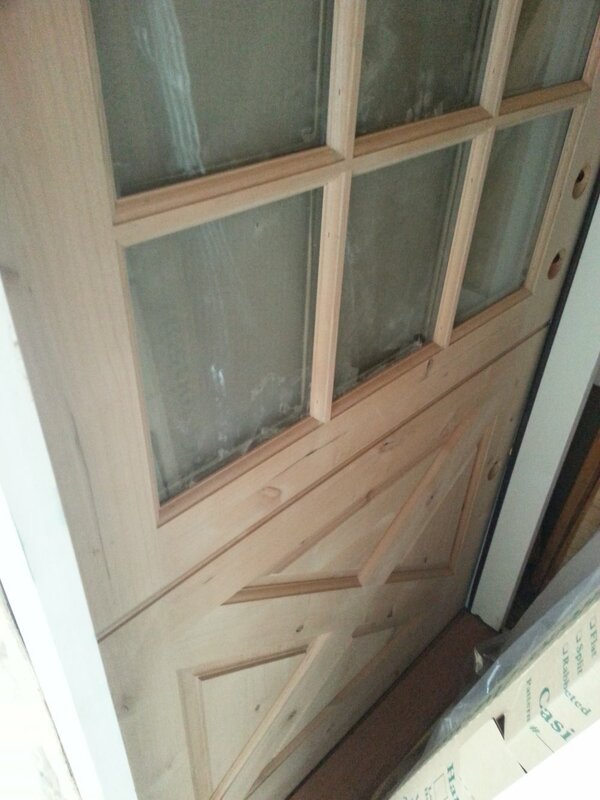 Because pre-hung doors are perfectly fit in the jambs, they are best used by do-it-yourselfers and basic carpenters. Also, should you have a damaged door frame, a pre-hung door is the best choice. To determine the size door you need, measure horizontally across the width of the door slab and vertically from the floor/sill to the top of the door. Most doors are called by their nominal size—the size of the slab, e.g., 32” x 80”. Typically, the rough opening for a pre-hung door is 2.5” wider and 2.5” taller than the nominal size. A door that is full and square will measure exactly the nominal size, while one that is pre-fit and beveled will be slightly smaller because it has been adjusted to fit into the jamb. For a pre-hung door, consider which way you want the door to swing. If you need an exterior door, Greg recommends considering the benefits of an outswing door. “When the wind blows on a door that swings outward, it helps to seal the door,” he said. Also, if security is a concern, it is far more difficult to break in a door that swings outward than it is to force an inswing door. Most locks for doors are deadbolts: a metal bolt slides into the jamb, preventing the door from being opened. While these are fairly secure, a multi-point lock takes security to the next level. The deadbolt is usually dependent on the strength of the wooden jamb that it slides into, which isn’t nearly as strong as the bolt itself. A multi-point lock includes one that works like a deadbolt, one that runs through the jamb near the top of the frame, and one that rides through the jamb near the bottom of the frame. This makes the door more secure. Endura sells a multi-point lock as a feature of its astragal—the strip that fills the gap between two doors. The secure astragal is paired with a sill (which fills the gap at the bottom of the door) to create an energy-efficient, secure door. Applying a complete coat of paint to an exterior door will protect it from the elements. Properly coating the edges is sometimes overlooked, but very important. Natural wood doors can be refinished with spar varnish, a marine product that will stand up to the elements. To prevent drafts, apply weather stripping to the top and sides and a door sweep at the bottom.